Colorado. Isn't that word incredibly beautiful? Doesn't it simply slip like silver from your tongue in the most appealing way. Now, look at this horse and say, "Hello Colorado!" in a soft and soothing tone. He may turn his head slightly to acknowledge you. Notice the small pieces of grass at the side of his mouth. See the soft gentle look in his eyes as he gazes over the plain. 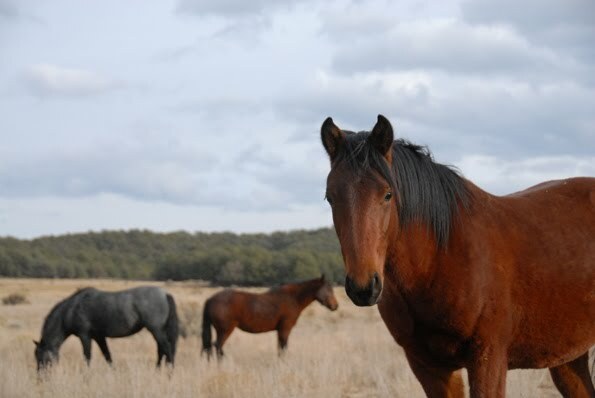 He's one of New Mexico's endangered Mustangs. Not endangered by Mother Nature, but by man. See my earlier post http://flyingsolotravelinglight.blogspot.com/2009/12/mustangs-rounded-up-for-slaughter.html. Robert, whom I spoke of in that post, and who shot these photos, has adopted and named this handsome animal. A solution must be found. Allowing these animals, whose birthright it is to be on this planet, to be slaughtered or held in 'holding facilities' is not a good, nor a right answer to a situation which has been created by man. Adoption is one thing we can do, at least in the interim. For more information on Adopting a Mustang, please contact Sandi Claypool 575-756-8674 and/or visit http://www.moneromustangs.org/. 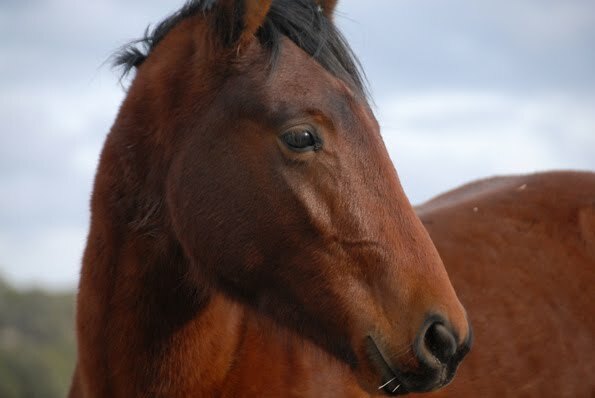 This site, called Monero Mustangs Sanctuary, will give you all the insight you need to understand the plight of these wild animals. Please, pour yourself a cup of coffee, or a glass of wine, sit down and find out more. We can never have too much knowledge or awareness. This deserves our attention. Many of us will not be in a position to adopt. ALL of us are in the position to put the word out there. Talk about it, discuss it with our family and friends. Pass it on. These animals need our help. Many more people need to be made aware. We can all do our part in that department. "PS: I would feel so blessed if any of my images of the mustangs helped save some of their lives.... I adopted one on my last photo shoot as he came from the back of the herd and just followed me around while I shot... so beautiful, named him Colorado...."
I truly believe animals have a knowing. It is no coincidence Colorado followed Robert around the field that day. He 'knew'. Haze and 66 degrees F. Wind from WNW at 5 mph. Humidity 60%. "When Allah created the horse, he said to the wind, "I will that a creature proceed from thee. Condense Thyself." And the wind condensed itself, and the result was the horse. ~ Marguerite Henry, King of the Wind.